Bengaluru FC, on Wednesday, announced the signings of strikers Kim Seng-Yong and Seiminlen Doungel as the Blues are looking to build on what’s been a successful second season where they finished winners of the Federation Cup, runners-up in the I-League and made the last-16 of the AFC Cup. 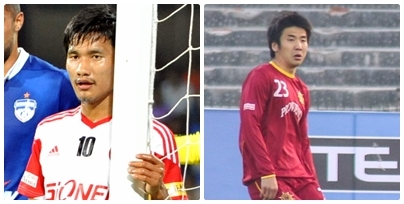 North Korean Kim is no stranger to Indian football having turned out for Rangdajied United before he switched to Royal Wahingdoh last season where he played a key role in the club’s third place finish. A clinical finisher with an impressive aerial prowess, Kim will replace Australian striker Sean Rooney whose contract with the Blues has expired. “I am extremely happy to have signed for Bengaluru FC. I consider myself lucky to have been given a chance to play for a club like this. They have done an amazing job on and off the pitch over the past two years. I am looking forward to playing under the guidance of Ashley Westwood and the rest of the staff, and I will do my best to contribute towards the team's success on all fronts,” said Kim who is on a one year deal with the club having the choice to extend it for another year. Twenty-one-year-old Manipuri lad Doungel, who has signed a two-year deal, is the other addition to the Blues’ armoury alongside Kim. The former East Bengal and Shillong Lajong striker said he was excited on signing for the Federation Cup champions. “It makes me happy to say that I am part of Bengaluru FC. It’s a club where I know I will improve as a player and I cannot wait to be a part of wonderful things the club does,” said Doungel. Bengaluru FC COO, Mustafa Ghouse said the duo had caught the coaching staff’s attention for a while and that Blues were happy to have closed on their targets. “Kim and Len are both very talented players and have been on our radar for some time now. We are certain the fans will be happy to see them in the BFC blue next season, just as we are. We would also like to thank Sean Rooney whose contribution to the club in our first two season has been immense and we wish him all the best for his future endeavours,” said Ghouse.